During my years living in New York, I always felt like my life as a Manhattanite was a little different than others. But then that’s what makes Manhattan so great! EVERYONE is “a little different.” 😉 Unlike most of my friends, my closet contained more camping and hiking gear than it did designer shoes. That should have been a clue. I was also a proud card-carrying member of the Appalachian Mountain Club. Since I didn’t own a car, it would not have been a practical affiliation were it not for their cabin out on Fire Island, just a couple of hours away via the Long Island Railroad. Being able to stay in a beachside cabin for only $50 a night, albeit in a dorm room, made membership in the AMC well worth it. 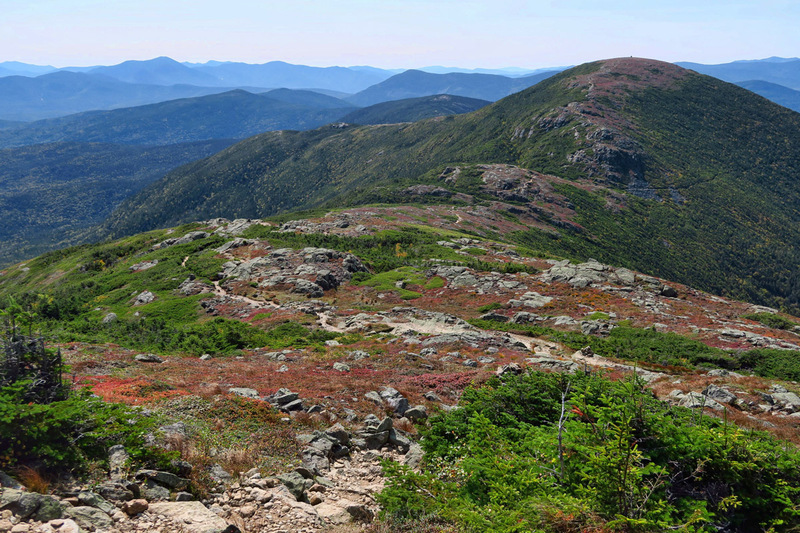 The Appalachian Mountain Club, founded in 1847, is one of the oldest outdoor clubs, originally geared toward exploring the White Mountains of New Hampshire. Being an AMC member means receiving their monthly magazine, AMC Outdoors. 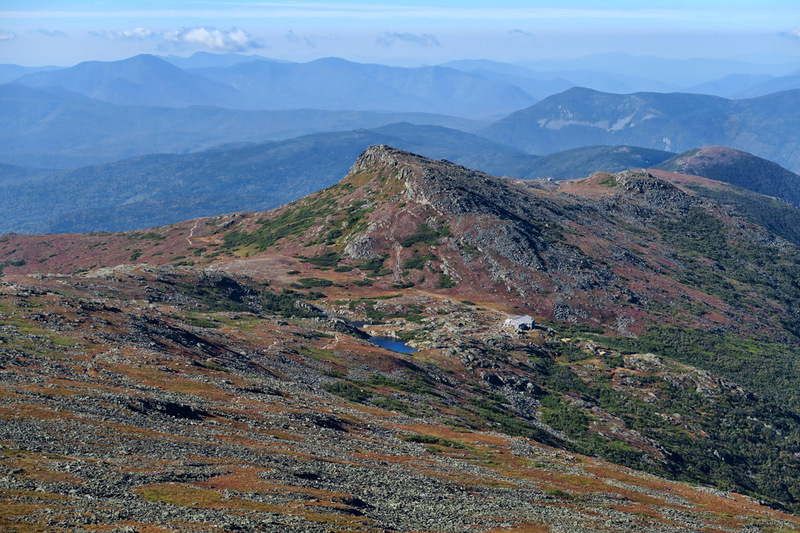 Always filled with full page spreads on their extensive High Hut system throughput New Hampshire’s Presidential range, the glossy photos had me dreaming of a “hut to hut” hike one day. The allure of reaching a mountain respite only accessible by the power of one’s own two feet, leaving one hut and arriving at the next, filled with warm hospitality and hiker camaraderie has always called to me. The shuttle over to the Highland Center, site of the trail head for the Mitzpah Springs hut, takes about two hours. The beginning of the hike is through dense evergreen forest. It’s somewhat rare to find mountain huts In a country so full of natural wonder. Seems if it can’t be seen from the driver’s seat, there’s not much interest. 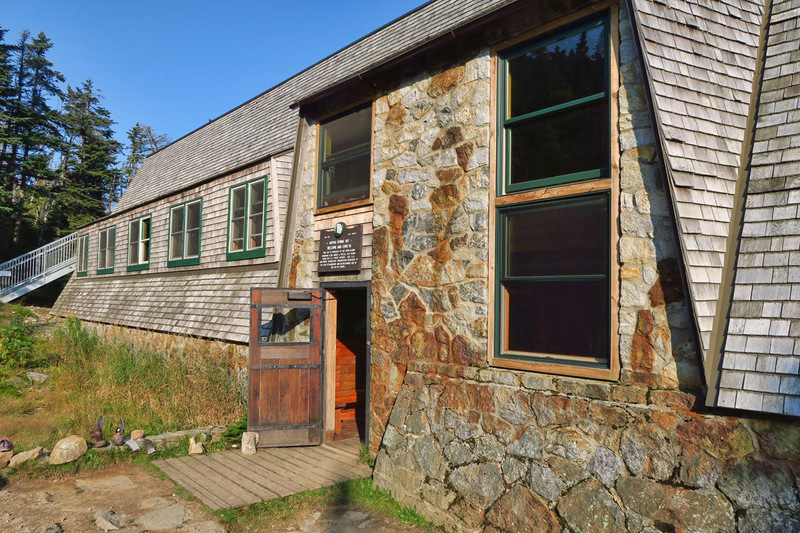 There are a few hike-in lodges, like The Hike Inn in the Georgia Mountains, or The Mt LeConte Lodge in the Great Smokey Mountains. The Sperry Chalet, located in Glacier National Park sadly just burned to the ground before I had a chance to visit. And a few more out west, mostly in Colorado. So to find a string of eight “full service” huts along a well maintained hiking trail is a treat not to be missed by a hiking enthusiast like me…particularly while I’m parked in western Maine near the New Hampshire State Line. 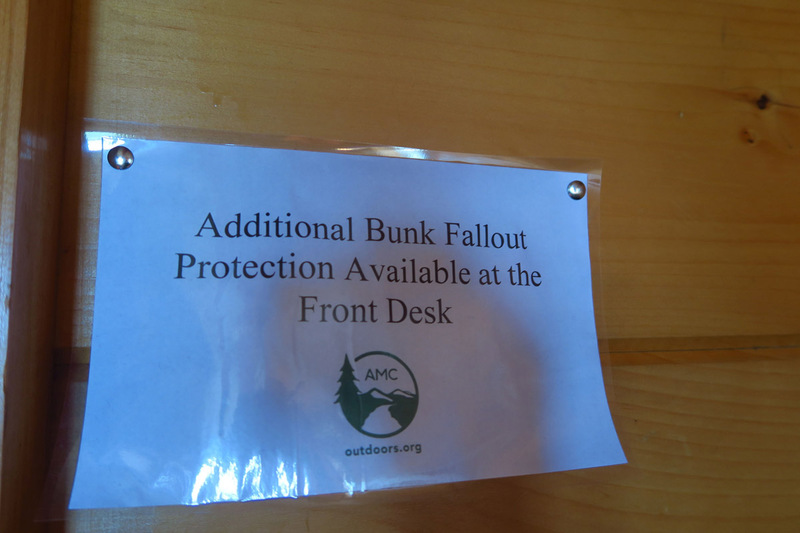 The staff of the AMC Hut reservation line is extremely helpful. Since I am not familiar with the area, I need advice so I don’t book huts that are too far apart, or in the wrong sequence, particularly since they are not cheap, and I’m now within the “no refund” cancellation period. 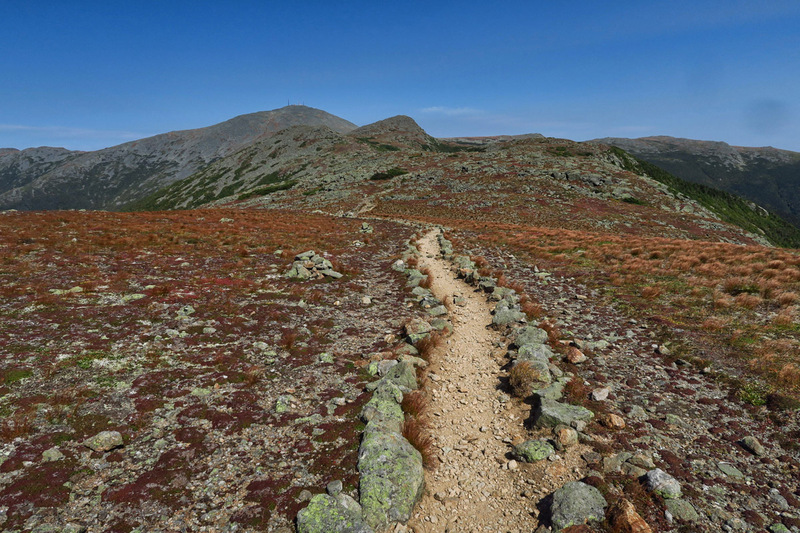 I explain my hiking abilities, as well as my desire to do a “hut to hut,” as opposed to a “lodge to hut” (which would mean departing and arriving from a parking lot.) I want to hike to different huts. Not only does the reservationist help me with trail advice, but she tells me I can leave the Winnie parked at Pinkham Notch Visitor Center. Overnight accommodations not just for me, but for the Winnie too! 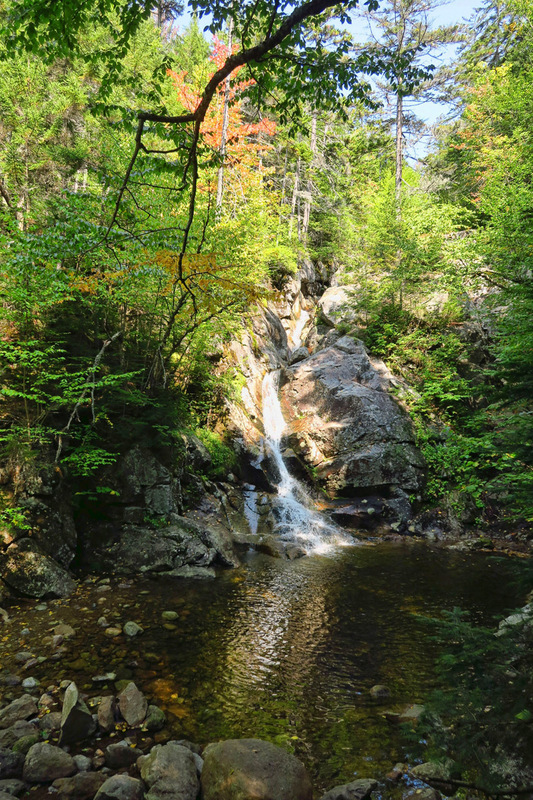 Gibbs Falls along Crawford Path on the way to Mitzpah Springs hut. 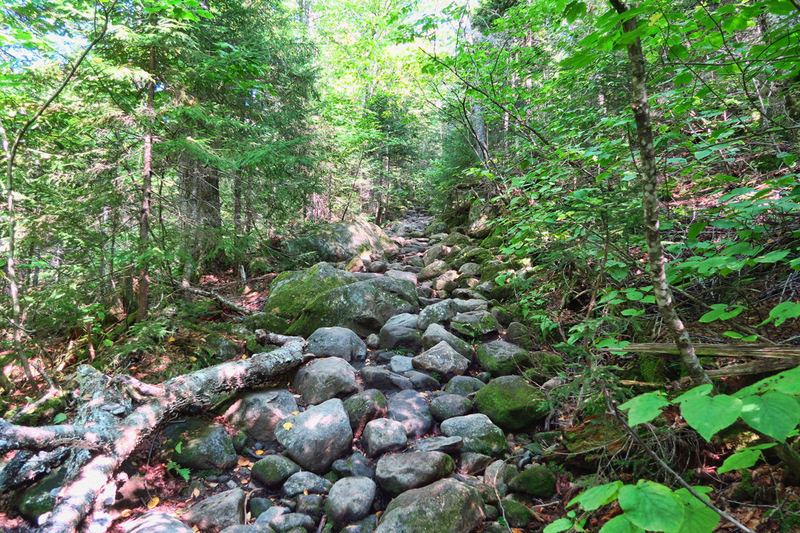 At one point, the trail turns into this brutal dry creek bed with ankle-roller stones. At this point, I stop for a second and consider turning around…glad I didn’t! 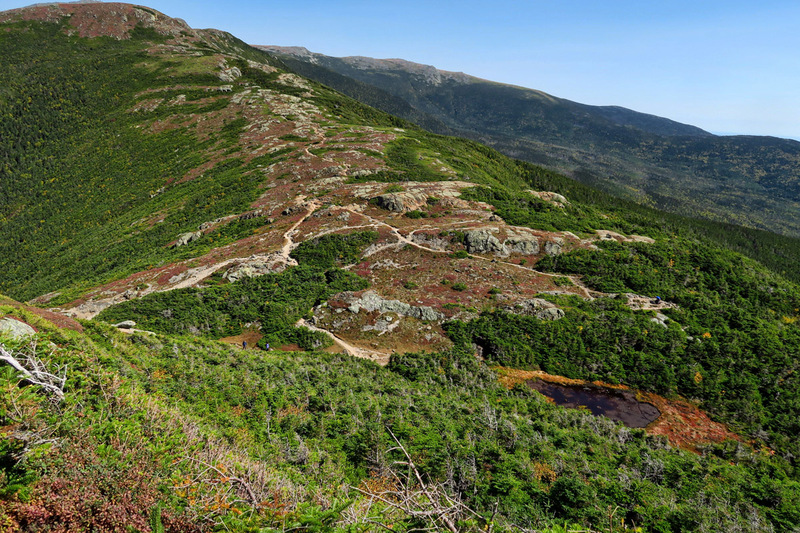 I’ll be taking the AMC Shuttle Bus from Pinkham Notch Visitor Center. It’s a two hour ride around the mountains to the opposite end of the shuttle system, the Highland Center, where I will begin my hike. I’ll spend the first night at the Mitzpah Springs Hut (elev. 3,800’) and the second night at the Lakes of the Clouds Hut (elev. 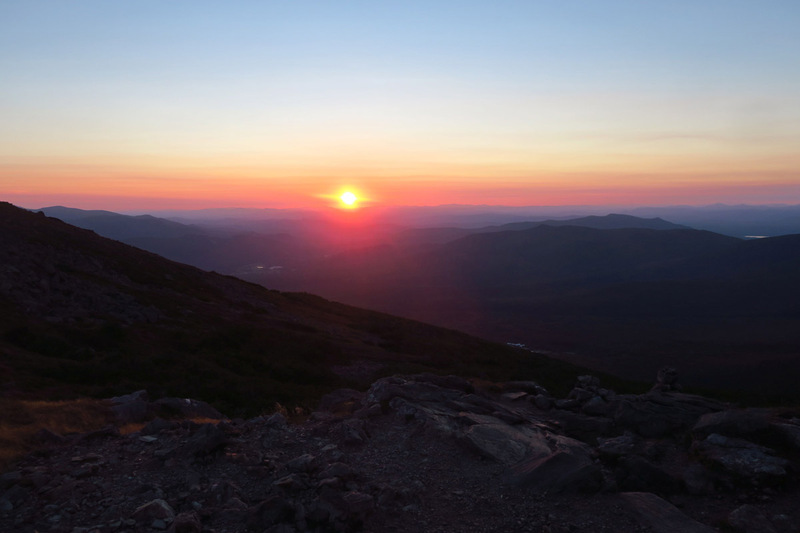 5,030.’) From there, depending on how I feel by the third day, I can push on toward the summit of Mt. Washington (elev. 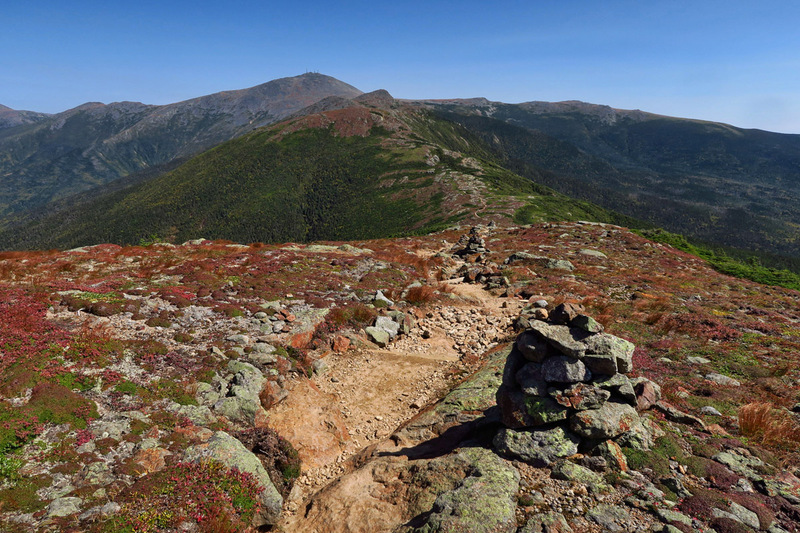 6,288’) before hiking back down to the Winnie at Pinkham Notch. The first day hike up to the Mitzpah Hut is considered “easy” by White Mountain standards, only a 2.6 miles, but with a 1,900’ elevation gain, it’s “nothing but up.” Although I’ve been walking a lot while in Maine, I haven’t been doing any elevation gain aside from one or two hikes up the local ski “bunny hill.” So the constant climbing over ankle-rolling rocks and toe-trapping tree roots is tiresome. It doesn’t help that New Hampshire is experiencing record high temps. At a couple of points along the grueling climb, I am grateful that my hut fees are nonrefundable; otherwise I might be tempted to turn around! 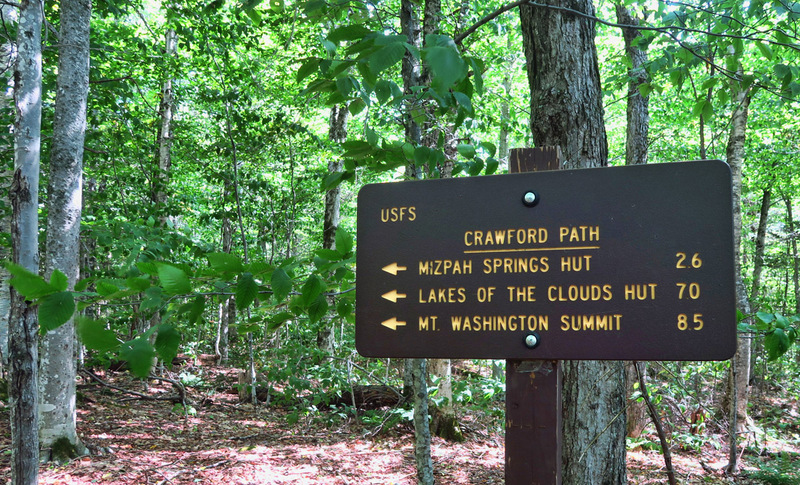 Mitzpah Springs Hut, built in 1964, is the newest in the trail system. It was the first to have building materials flown in by helicopter. 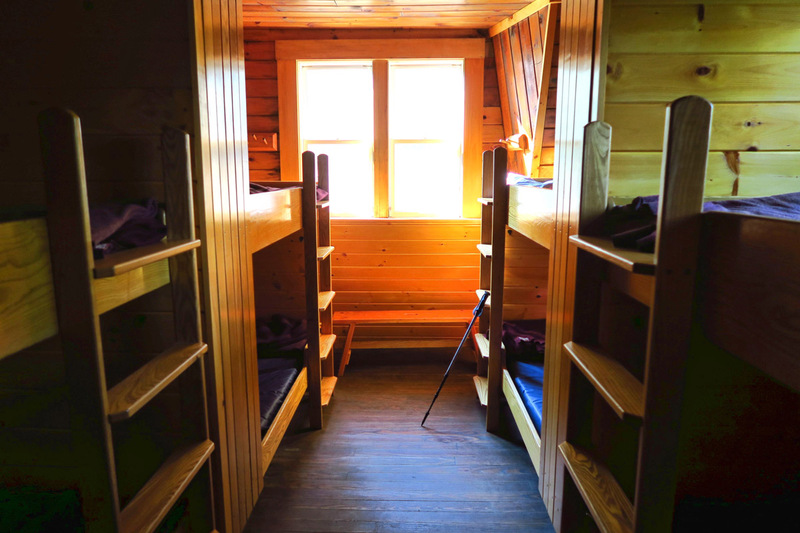 Mitzpah Springs Hut sleeps 60 in several different bunk rooms. Mattress, pillow, and three wool blankets are provided. Hikers BYO sleeping bags. The eight High Huts are all serviced by hut crew, (or “croo” as they spell it) young college-aged staff members who work a rotation of 11 days on, two days off throughout the hiking season. 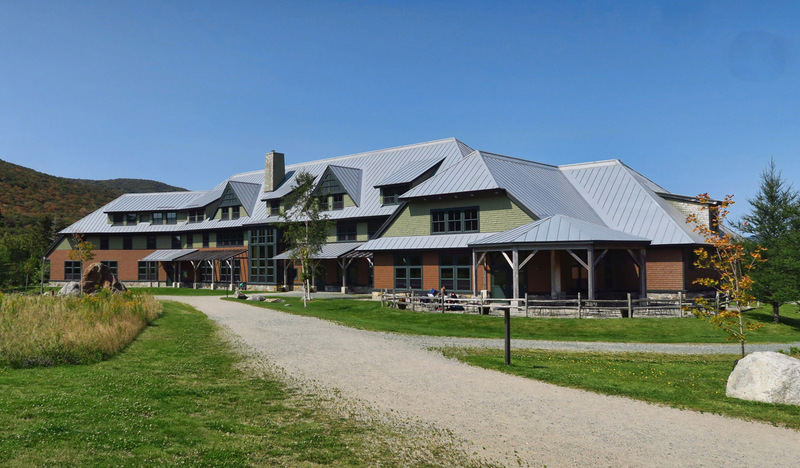 They maintain the huts, clean the bunkrooms and bathrooms, handle the check-in process, and crank out two full meals with snacks in between. The breakfasts are what you would expect for hearty hikers; oatmeal, eggs, bacon, pancakes and coffee. Dinners are four courses; homemade piping-hot soups, fresh salads with homemade dressing, a main course with vegetable, and dessert. And of course, the best part of the meal is their famous freshly baked bread. Their willingness and ability to cater to certain dietary restrictions (vegan, gluten-free, dairy free) in such a remote location is remarkable. These young kids work so hard…this young woman was on her sixth season in the huts. Second day hike, leaving the Mitzpah hut, I finally break out above the treeline. Some stretches of the trail are carved into rock. 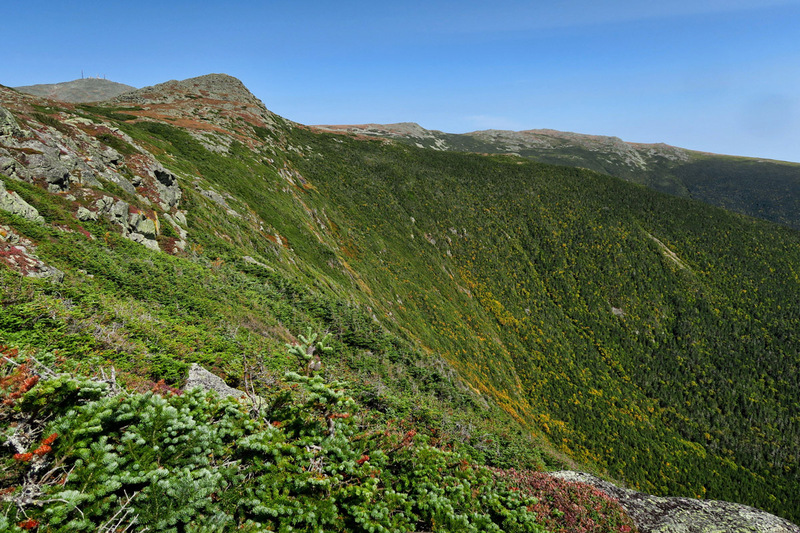 The second day is my favorite hiking day, as the entire 5 miles would be along a ridgeline, with beautiful views. 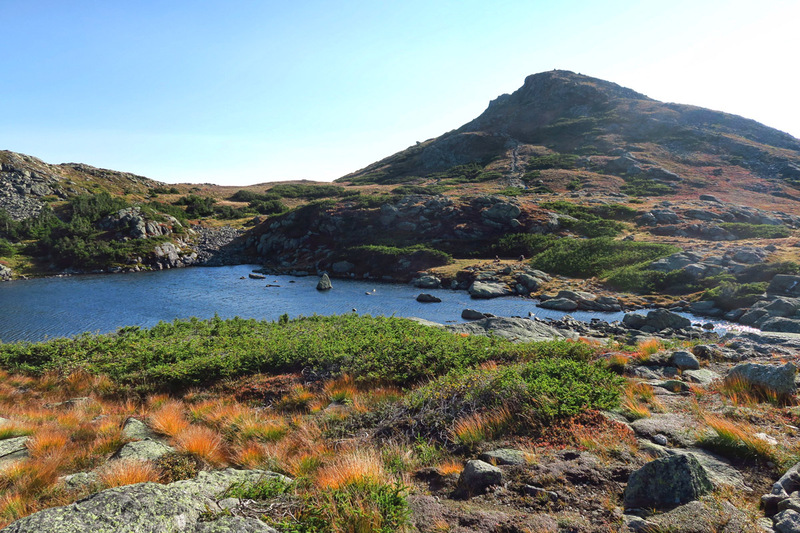 The second day of hiking was by far my favorite…hiking above tree-line across four summits, Mt. Pierce, Mt. Eisenhower, Mt. Jackson, and Mt. Monroe. 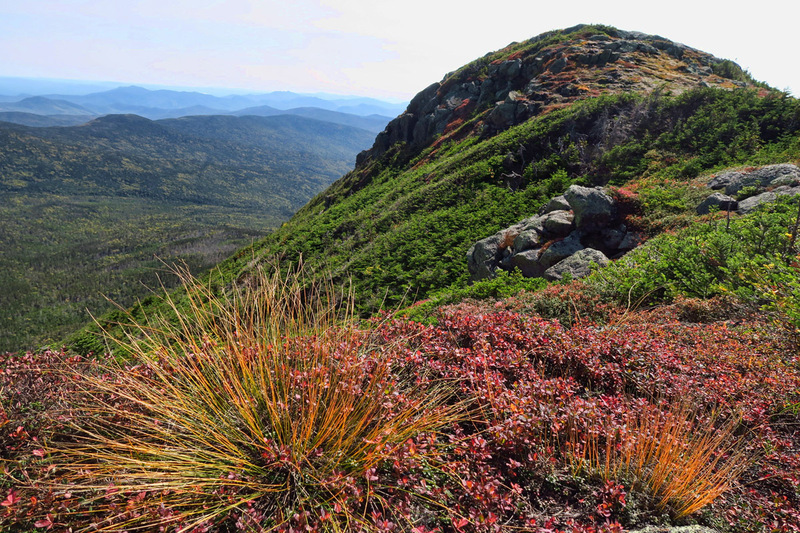 This 5 mile stretch follows the Appalachian Trail, and it’s mostly ridgeline all the way with spectacular views in every direction. 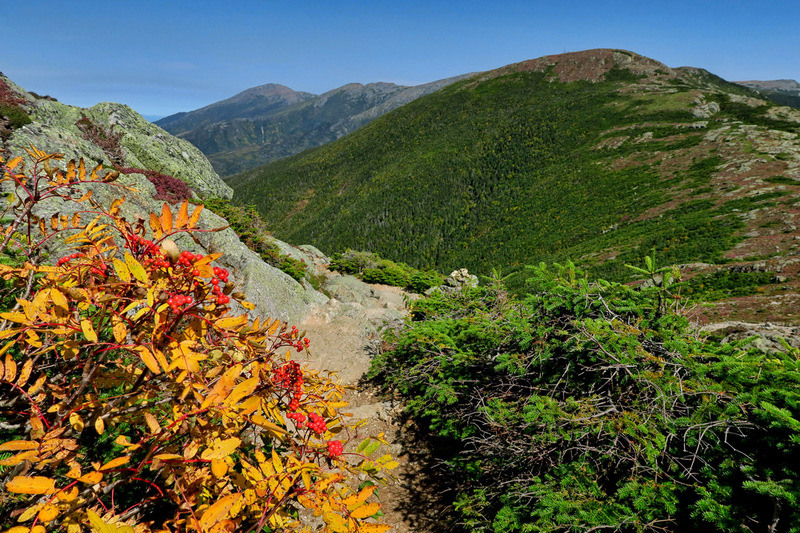 A high pressure system overhead brings a rare shorts and teeshirt day in the White Mountains, notorious for their extreme weather. 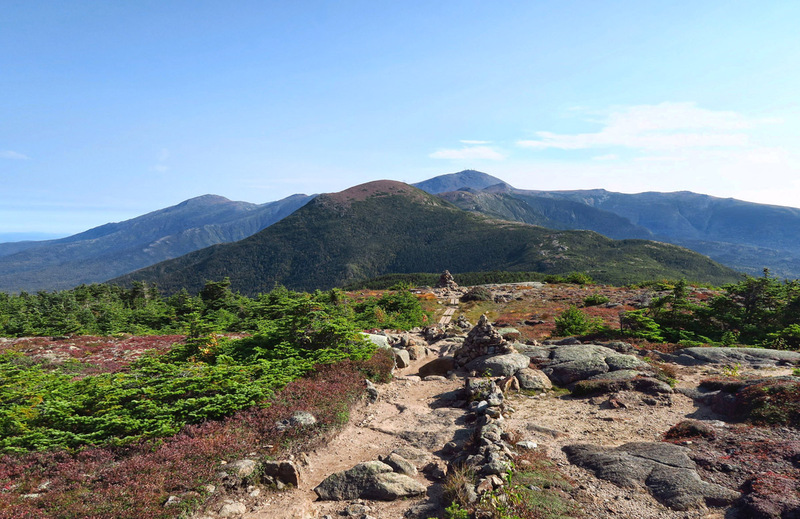 This hike follows the Appalachian Trail,crossing several of the Presidential summits, this one Mt Eisenhower, 4780′. The trail between Mitzpah and the next hut, Lake of the Clouds, crosses four summits in the Presidential Range; Pierce, Eisenhower, Franklin, and Monroe. In the distance is the highest of the Presidential Range, Mt. Washington, at 6,288′. 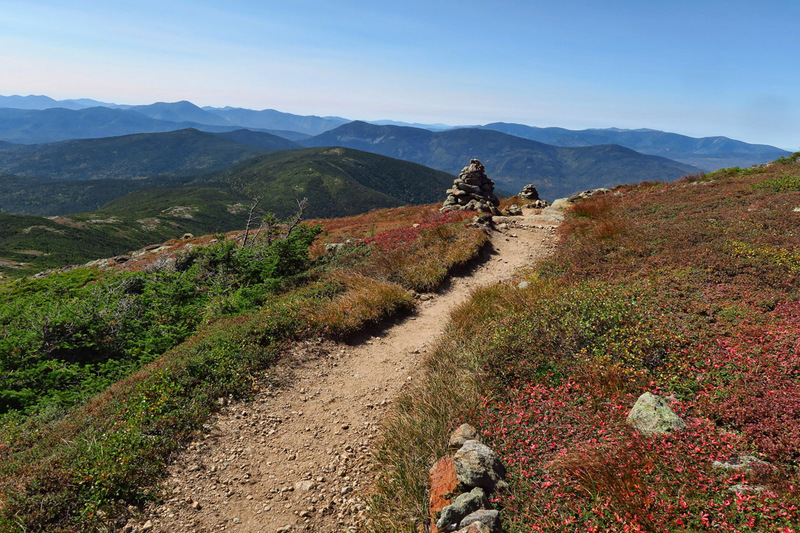 The trail is easily marked, as it has been traversed for over 100 years. Leaving Eisenhower Summit on the way to Mt. Franklin. elev. 5,003′. Looking out over one of the many ravines. The second night along my hut to hut hike is spent in the Lakes of the Clouds hut, the highest and largest in the AMC High Hut system. At over 5,000’ elevation, it is also the coldest, making me grateful I schlepped my sleeping bag to the top, rather than the optional “sleep sheet.” The only “heat” in the huts is generated by body heat. They are completely off the grid, using propane for cooking only. 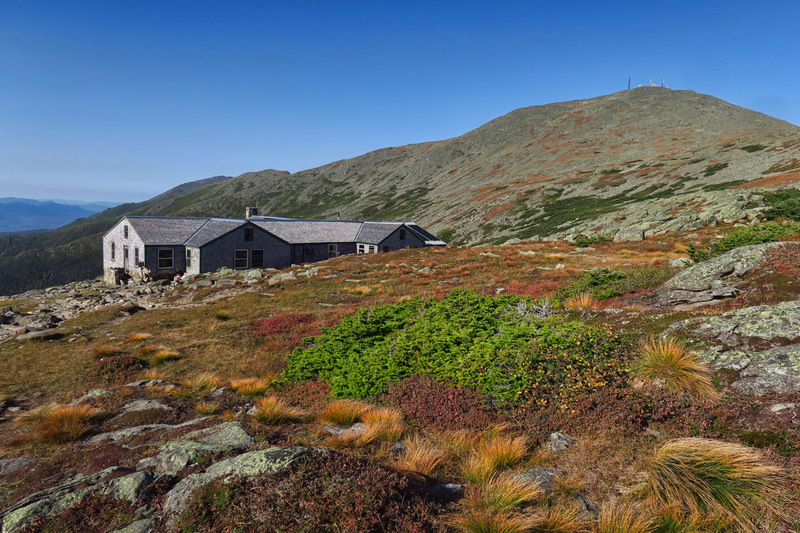 Lakes of the Clouds is also the most popular hut in the AMC system because it sits in the shadow of Mt. 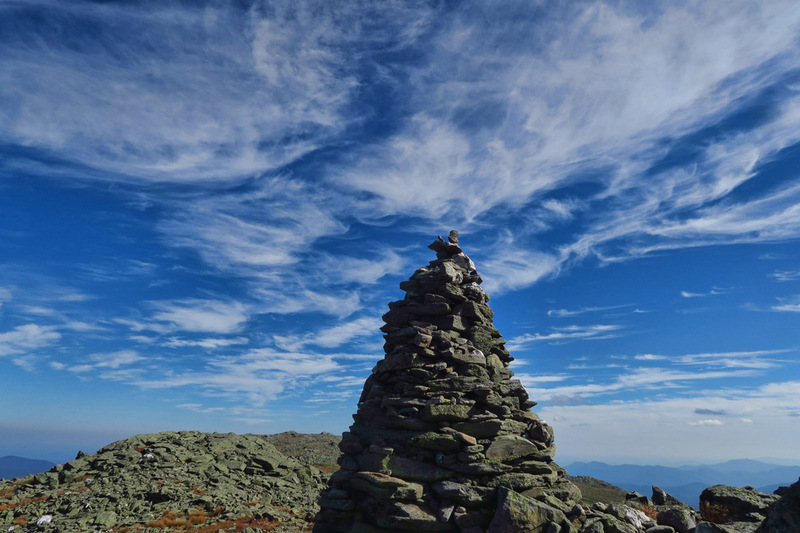 Washington, highest peak in the northeastern US. It is also infamous for notoriously bad weather, having at one time clocked winds at 231 mph. For this reason, I haven’t allowed myself to be too “goal oriented.” I have in the back of my mind that I want to make it to the top. I know I will regret having come all this way and not at least attempting it. But I also know conditions must be right come morning…decent weather, clear visibility, and not too weary from the previous two days, as I still have to get back down. Arriving at Lake of the Clouds hut, at elev. 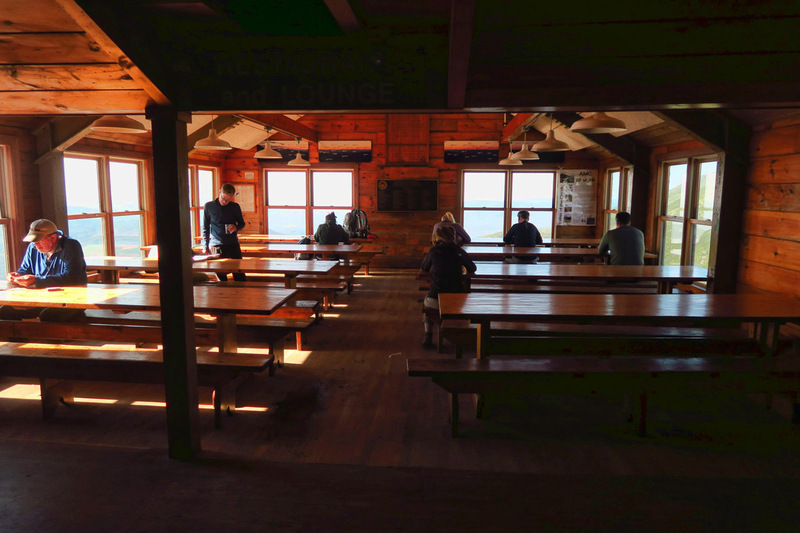 5,030′, the highest elevation of the huts. It started out as a shelter in 1901 in response to deaths on Mt. Washington due to extreme weather conditions. Lakes of the Clouds Hut is also the largest, sleeping 90 hikers. 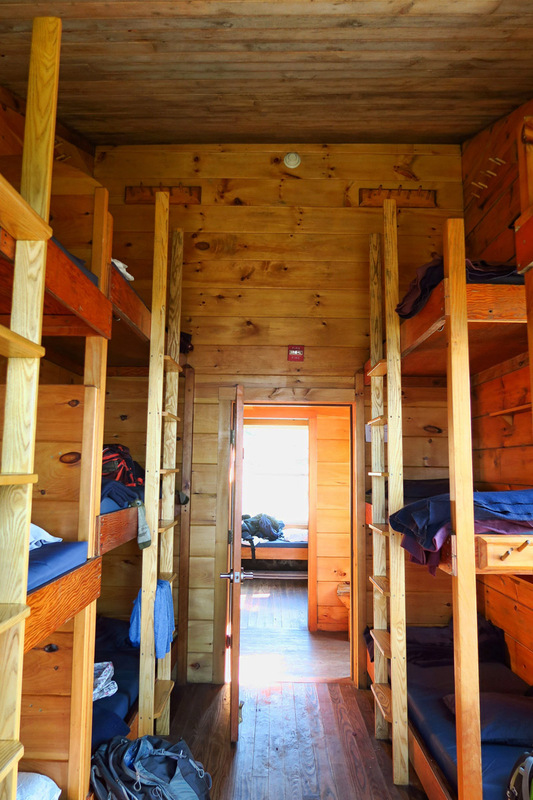 This particular room has three levels of bunk beds! Large dining area serves breakfast and dinner, and fresh baked goods and tea mid-day. 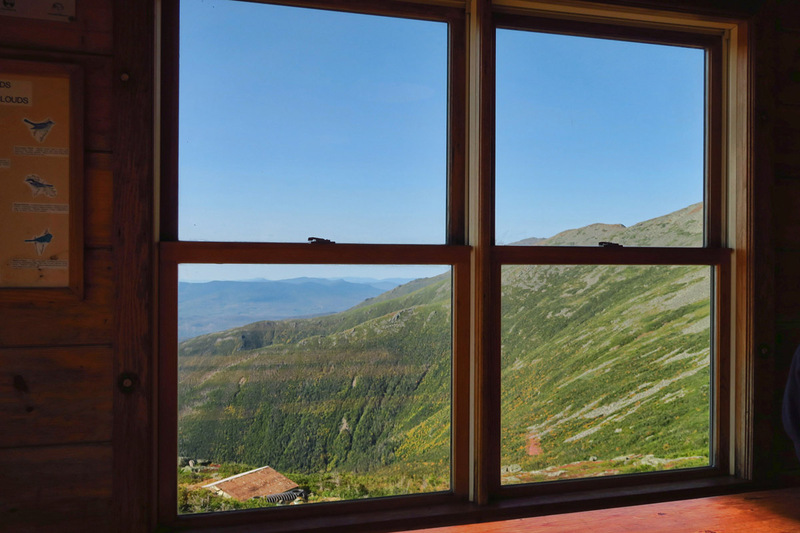 View from the dining room of Lake of the Clouds hut. 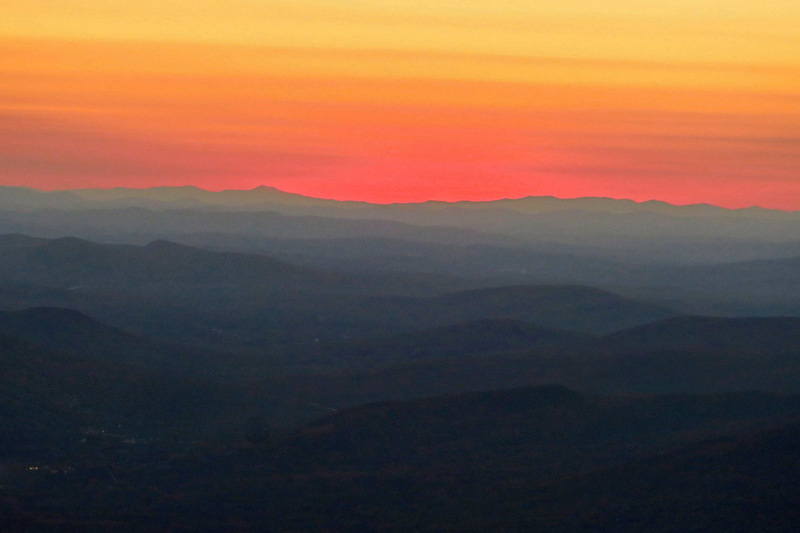 I love the many layers of color in this post-sunset scene. I wake up the next morning to fog surrounding the hut. The “Lakes of the Clouds” is living up to its namesake. But by the time breakfast is over, the clouds are rolling off the mountain, and the sun is peaking through. I feel well rested and ready to push on for the summit. I am at the top of the mountain by 10:30am. Several of the hikers I’ve met along the route congregate at the restaurant accessible by the “auto road” to the top. We all enjoy a brief celebration at having made it to the top. I don’t realize the worst is yet to come. There are a couple of options to descend the 5,000 ft down from the mountain. There’s the steep, exposed drop down the ravine, or the much longer spur billed as being “safer.” It goes down and back up over several mountain ridges before it gradually descends. I choose the more gradual route. But what I didn’t know is that it’s just a longer, more miserable version of the same boulder hopping….like peeling the bandaid off one hair at a time, rather than yanking it off all at once. Not used to hiking with a large, multi-day pack on my back, my center of gravity is off, causing me to have to go much slower than normal, which is already slow by most standards. I often times have to drop to my seat to get down the steeper parts. It ends up taking me the entire afternoon and on into the evening to get down the exhausting rock face. 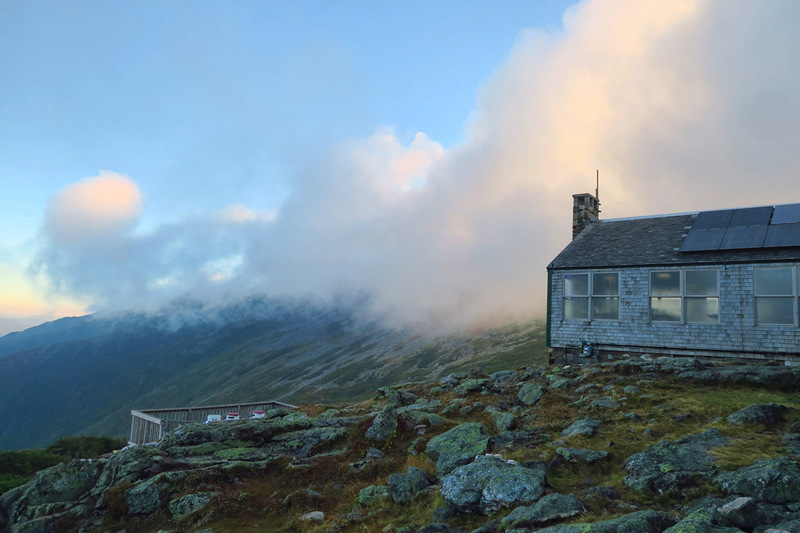 Awaking the next morning, the Lake of the Clouds hut reveals its namesake, as clouds pour over the mountains. 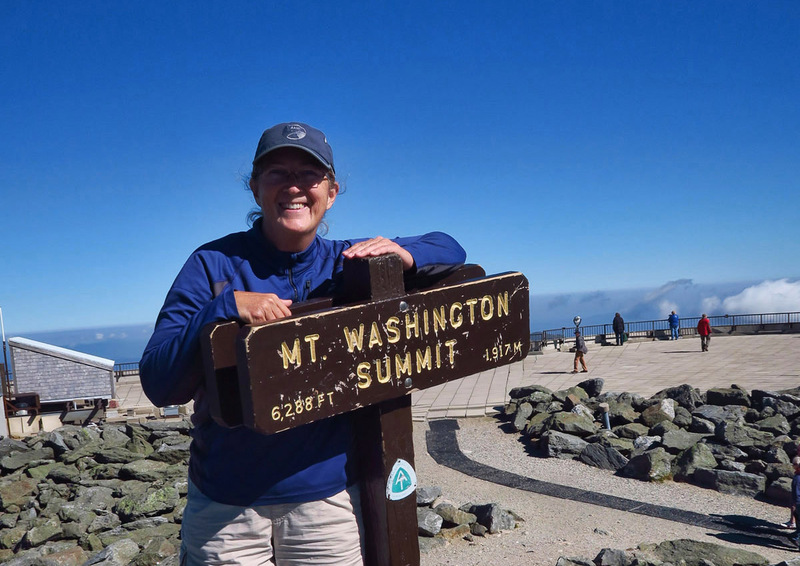 I am fortunate to have such a fine day on a summit known as “The worst weather in the USA” with wind speeds recorded up to 220 mph. Lake of the Clouds is surrounded by many small “lakes” that the trail passes the following morning. There is an upper and lower lake. AMC researchers have an acid rain research station nearby. 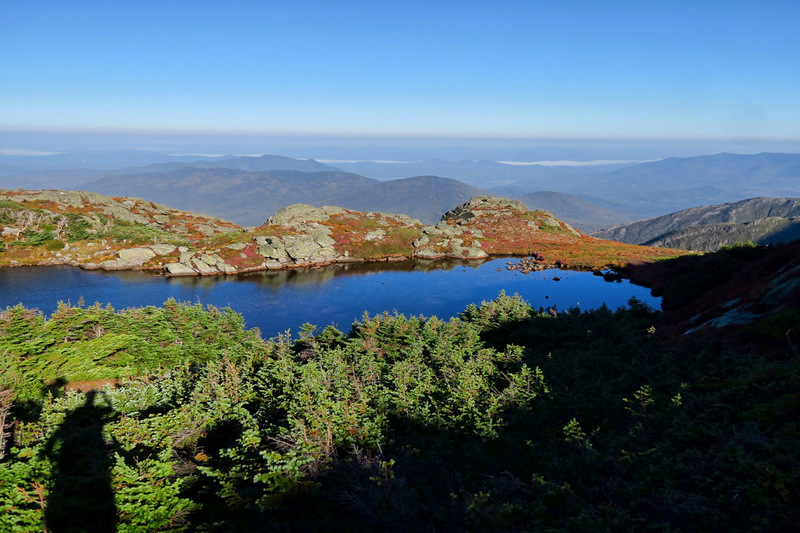 Looking back down on Lakes of the Clouds hut, with Mt Monroe in the background. The climb from Lakes of the Clouds hut up to Mt. Washington summit is brutal because the trail is nothing but big rocks. Happy to have made it! Little did I know at this point, the hardest part is yet to come…getting 5,000 ft down in one afternoon! 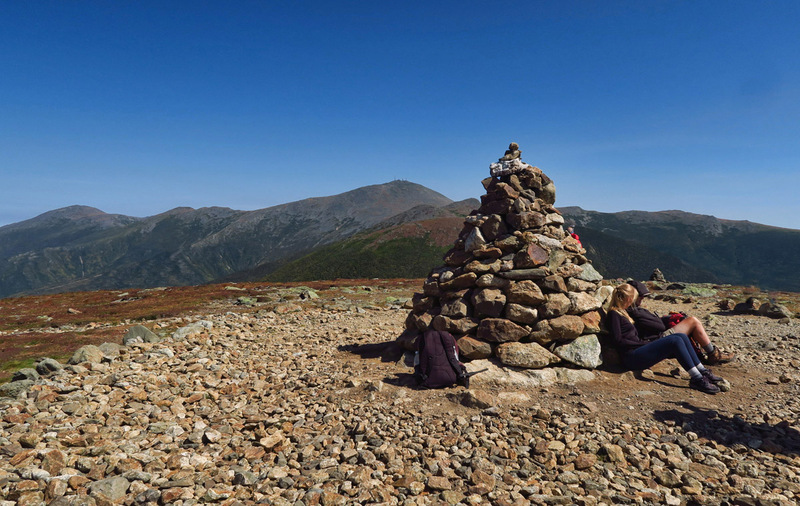 I talk about Mt Washington as if it were a monster summit. But hiking is different in the Northeast. This is one of the questions asked by several of the AMC staff when seeking their recommendation on hikes. “Have you hiked in the Northeast before?? Because it’s not like hiking in the west.” No joke. It’s solid rock, rarely a level stretch, and boulders the size of a coffin, with gaps in between that make that comparison feel a bit too literal. Fifteen miles and 5,000 ft elevation gain….It ain’t the Rockies…but it’s respectable. 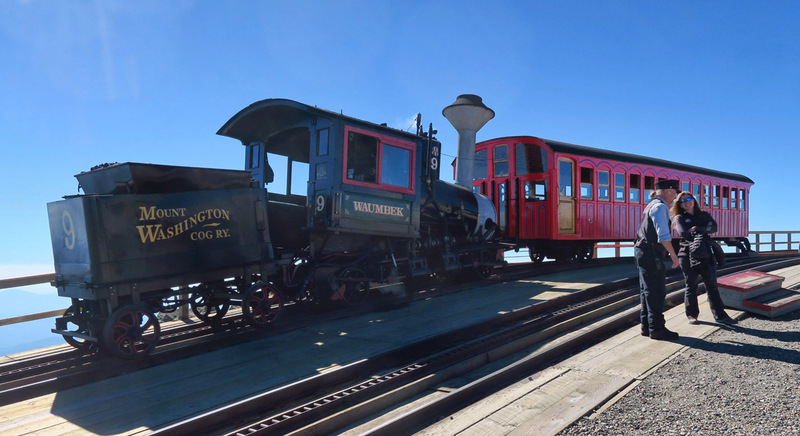 The Mount Washington Cog Railway, the first mountain climbing cog railway in the world, has been bringing passengers to top of the highest peak in the Northeast since 1869. 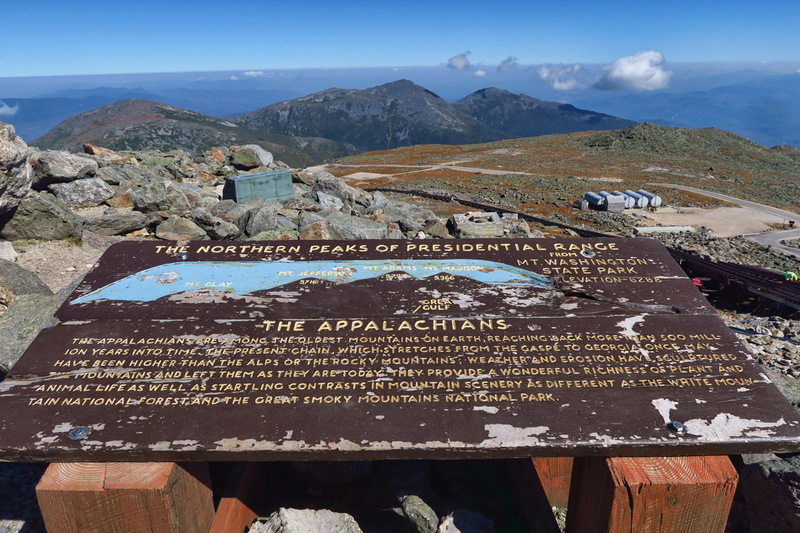 I have come up the southern Presidentials…to the north lies Madison, Adams, Jefferson, and Clay. The hike down is painful. Most of it is steep and deep on rocking horse rock. 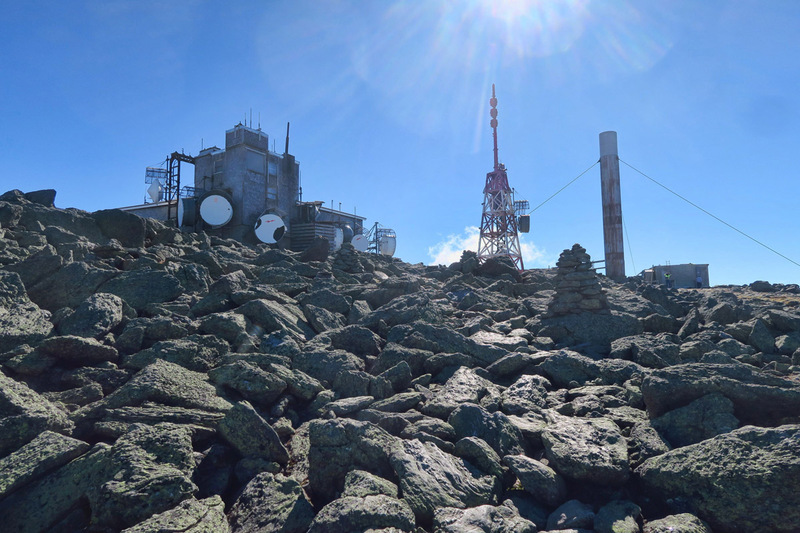 The AT has cairns like I’ve never seen cairns before! 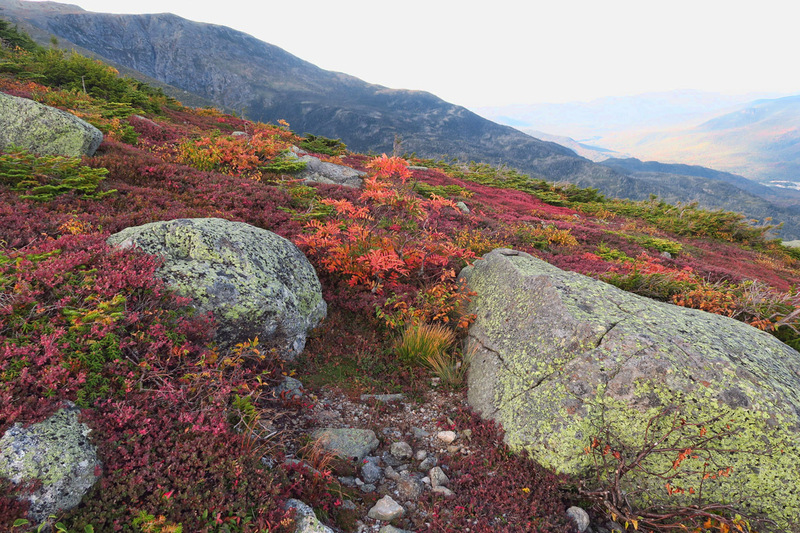 Fall color is more evident in the alpine sections. 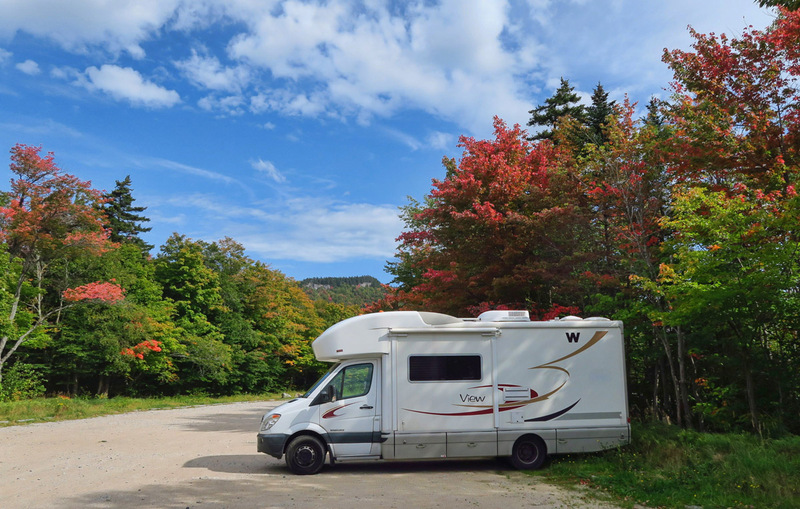 The Winnie is safely awaiting my return at the Pinkham Notch parking lot. 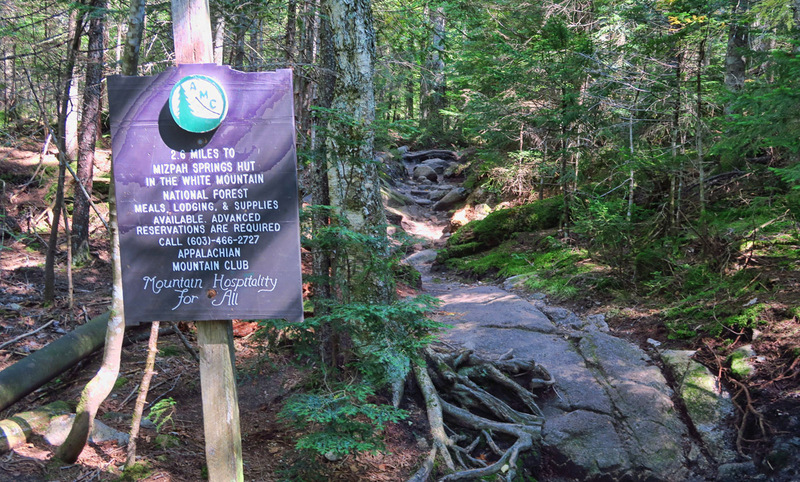 This entry was posted in New Hampshire and tagged Appalacian Mountain Club, Lakes of the Clouds Hut, Mitzpah Springs Hut, Mt Washington, Presidential Range, White Mountains by Suzanne. Bookmark the permalink. Suzanne, question to you that’s been on my mind since following your blog, do you use a tripod for your shots? Your shots are always so super clear. Find it hard to believe you’re able to hold the camera steady while doing all that exhaustive hiking? Congratulations on summiting Mt. Washington. The October weather has been very nice this year. 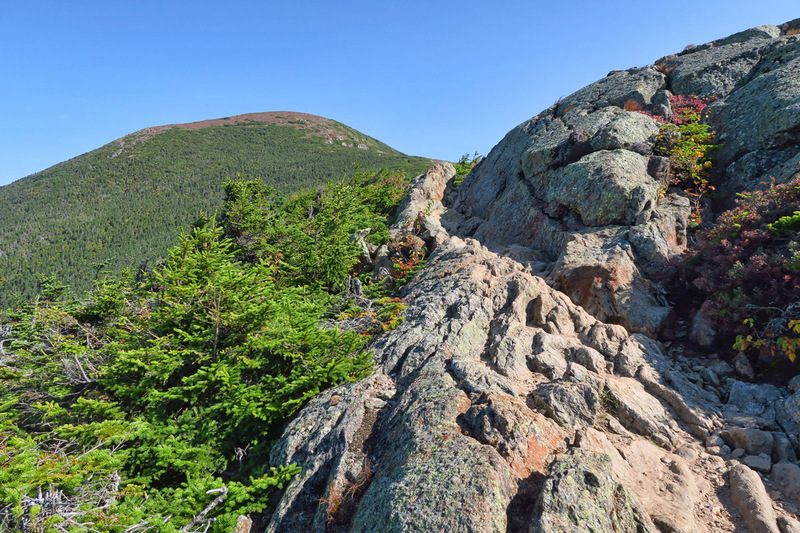 I’ve done a couple of peaks in the Presidential Range. They are challenging. Good to see you are back at it and in the north east too. 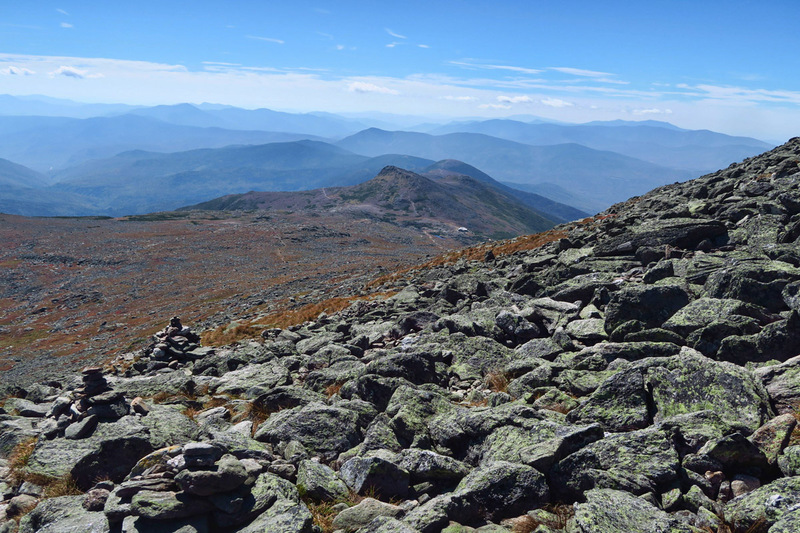 In my early life I tired out a few western hikers in the Adirondacks and the Whites. You had some beautiful weather for your time there and that only makes it better. Enjoy. This looks like fun except for those freaking boulders! I’ve always wanted to do a hut to hut…maybe some day…but those rocks!!!!! 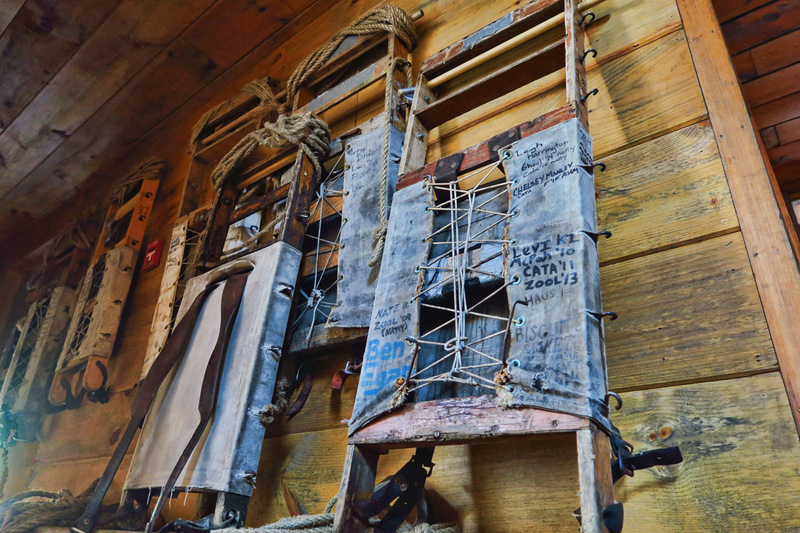 We did the huts in the Fall “shoulder” season over the years so we never got to experience the “croos” famous meals. The croo goes back to college with only a single care-taker left on board in the Fall. 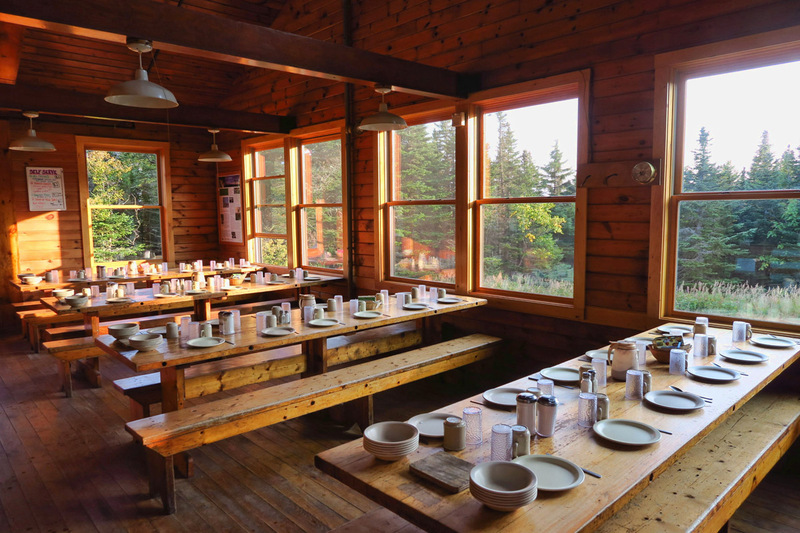 Since we didn’t have to haul a tent or cooking utensils, we devoted that space to gourmet offerings using the huts utensils and stove – sometimes combining offerings with the other hikers and having great feasts! I work stayed at Lake of the Clouds during my thru hike 21 years ago. Working in the kitchen after a day of hiking with a full pack wasn’t as easy as I imagined, although it was a lasting memory. Thanks for the report. I like those kind of flashbacks. You’re right, you are a lot different. Living where you did and having the passion for the outdoors and travel is a rarity in the masses of Manhattan. I am sure your Manhattan friends think you are nuts but secretly wish they had the courage to do what you are doing. Wow, these weren’t what I was expecting for “huts”. Years ago we tried to get a reservation at the Granite Chalet in Glacier, but couldn’t so we just did a day hike to it. I have heard about the boulder climbing at the top of Washington of though. My daughter and her family did it a couple of years ago and said it was miserable climbing at the end. Beautiful views, but those rocks look horrible. Thanks for doing the hike and posting photos so we could see what you saw. Oh wow. The weather gods blessed you so you could capture those pictures for us! My parents drove us to the top of Mt. Washington in 1966 on a beautiful day and I will never forget the view. Nevertheless, when I think of hikers up there I always picture it in cold windy fog! So glad you had gorgeous days, and so impressed with your hiking. You never cease to amaze me. 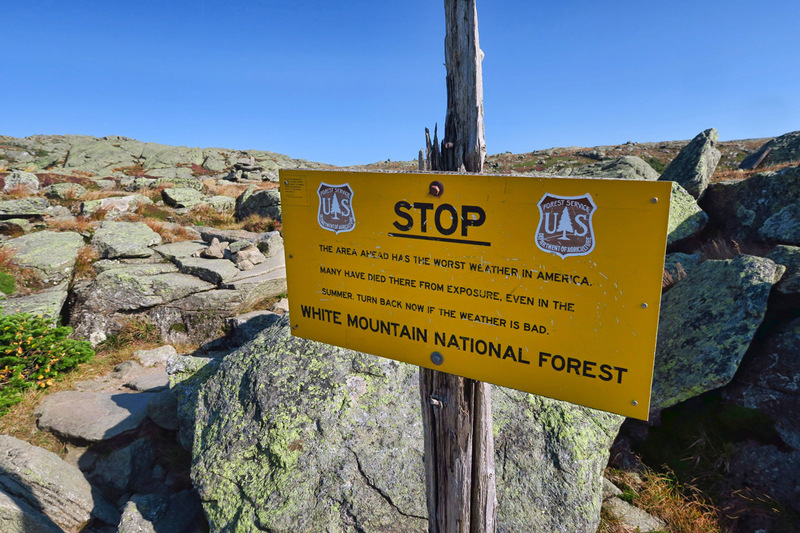 I have always wanted to hike the AT. 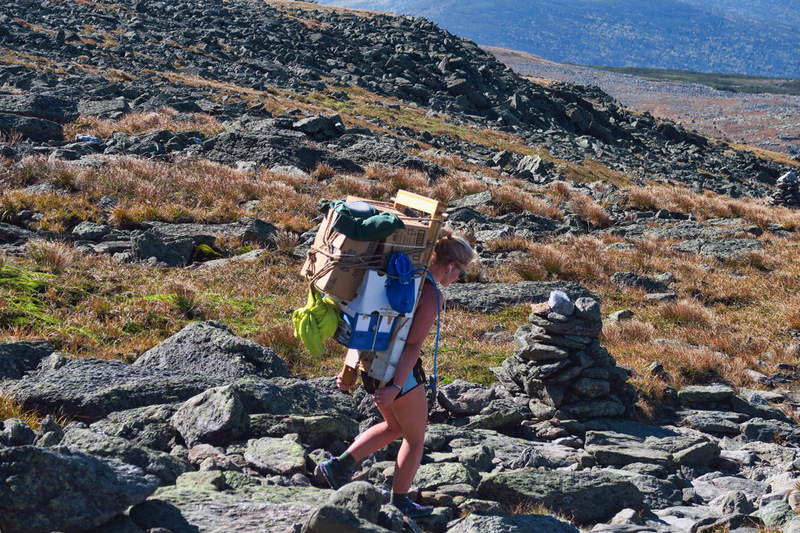 Our manager this past summer had done a thru hike about 5 years ago and it made me long to do a hut-to-hut, as I think I am beyond doing the entire AT. That downhill trek had my knees screaming. A big congrats to your stamina girlfriend! As always, I was gasping in wonderment the whole time! You really are exceptional! Way to go Suzanne, I do hope the memory of your 5000 ft descent quickly fades. I had the same reaction when encountering those boulders: This is the trail? Are you kidding me? This is where I turn-around. There was no way I could keep my camera at the ready; it was stashed-away for fear of imminent fall. P.S. I personally count Phantom Ranch as a hike-in lodge, even though it can be reached from the south rim by mule. One of the benefits of being late to the party is getting to read all the other viewers’ comments. I can’t add anything that hasn’t already been said but I’ll second that I’m so happy you did this hike for me (and photographed it beautifully) so I can scratch this one off the List. Yes, my quads are aching looking at the mass of boulders. Lovely trek, for sure. My friend Magda and I met you at Lake of the Clouds and had a wonderful conversation with you about your travels. Just wanted to reach out to tell you that you are an amazing human and your travel adventures are inspiring. Our conversation had a positive impact on myself and kindled my “wanderlust” into overdrive! !